Rarely in this world does a product succeed to the level of Legend status. It takes a design that is timeless, a concept that impacts an industry, and a composition that stands-up to almost any environment. LegendHDP by Florida Tile checks all of these boxes. The cultivated color palette, shade variation, and cleft surface of LegendHDP combine to make it the perfect representation of natural slate. LegendHDP was the first line to bear the HDP symbol of High Definition Porcelain®. Created to signify a revolutionary new product category, HDP still utilizes the most technologically advanced glazing system in the industry–digital printing. It brings you the most realistic image possible. The authentic look of stone draws your eye, but the durable properties of porcelain that outlast, outperform, and out-show natural stone are what makes this product a lasting Legend. 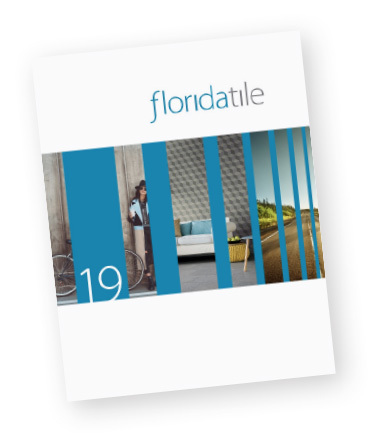 Field tile is available in two classic and proven pressed formats–12x12 and 18x18. Three color-options all provide V4 random shade variation that mimic naturally occurring hues: Titan has a base of dark slate grey complimented by lighter grays, rusts, and creams. Apollo is a tan with accents of gray, green, and slate blue. Magna is rust and slate gray with touches of cream and brown. A 36-piece mosaic and 3x12 bullnose in each color completes the offering. The entire LegendHDP collection is Made in the USA of 40% pre-consumer recycled content, is GREENGUARD® and Porcelain Tile certified, and meets the DCOF AcuTest® requirements to be installed in wet areas.